Portable, durable, and incredibly simple to fly; Parrot’s Bebop drone is probably the best quadcopter you can get for under $500. 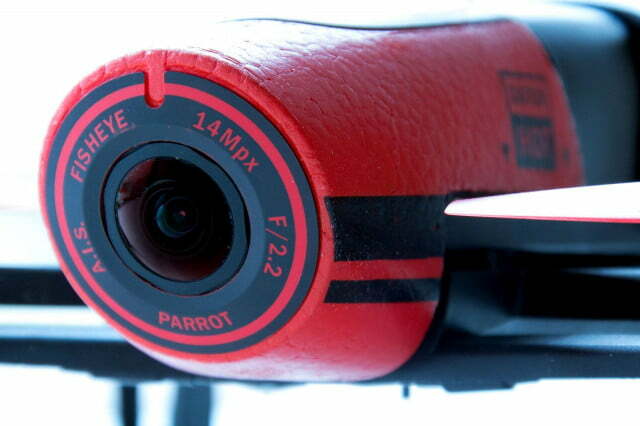 Parrot was one of the first companies to make a splash in the consumer UAV space when it released its AR 2.0 drone back in 2010. 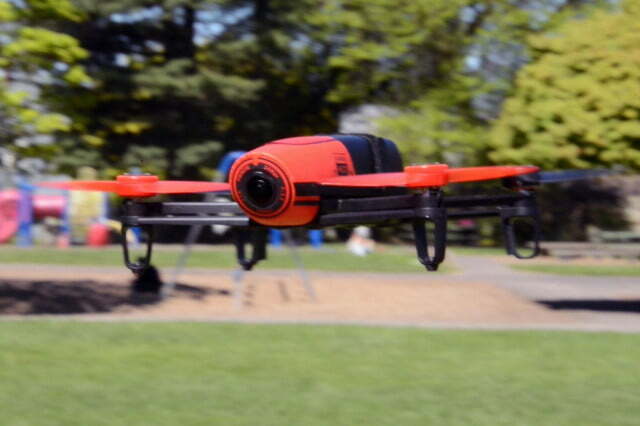 Now, just a few years later, it’s back with the Bebop — a smaller, smarter, more camera-focused drone. Priced at just $500, the Bebop promises many of the same features as drones that cost twice as much money, including GPS and streaming video. 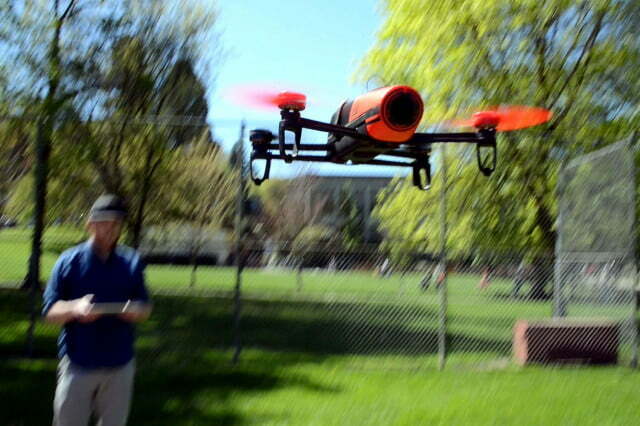 But can it really compare to more expensive UAVs? We took it for a spin to find out. 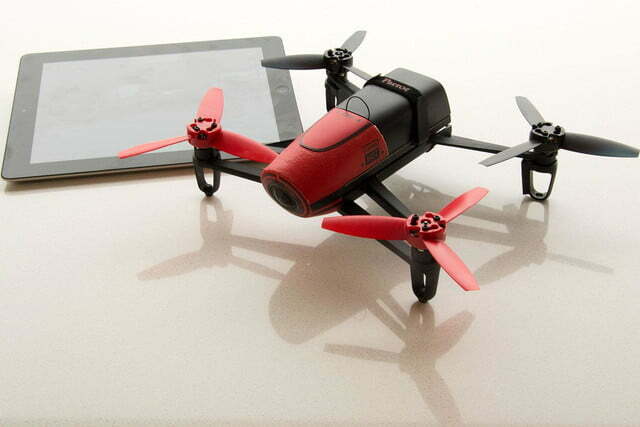 You’d never know it just from looking at it, but Bebop is a pretty feature-packed little drone. Under the hood it boasts four brushless outrunner motors, a 1,200mAH lithium-polymer battery, an HD camera, 3-axis gimbal stabilization, GNSS location tracking (GPS and GLONASS), and a boatload of other sensors. Flight time is pegged at around 11 minutes, and it ships with two batteries, giving you about 22 minutes of airtime total. If other drones are oak trees, the Bebop is a reed. It’s got brains too. Dig deeper and you’ll find Parrot’s P7 dual-core CPU, a quad core GPU, and 8GB of internal flash memory. All this, and the whole thing doesn’t weigh more than 400 grams. Apparently big things do come in small packages. 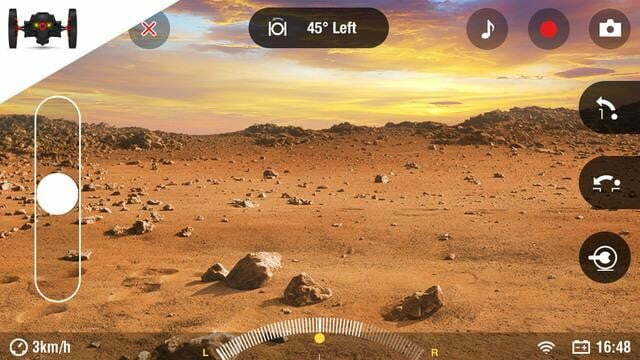 The drone comes ready-to-fly right out of the box, and all piloting is done from the user’s smartphone or tablet, through Parrot’s accompanying FreeFlight3 application (available for iOS, Android and Windows). If there’s one thing we learned from this drone, it’s that build quality and durability don’t necessarily go hand-in-hand. Let me explain. 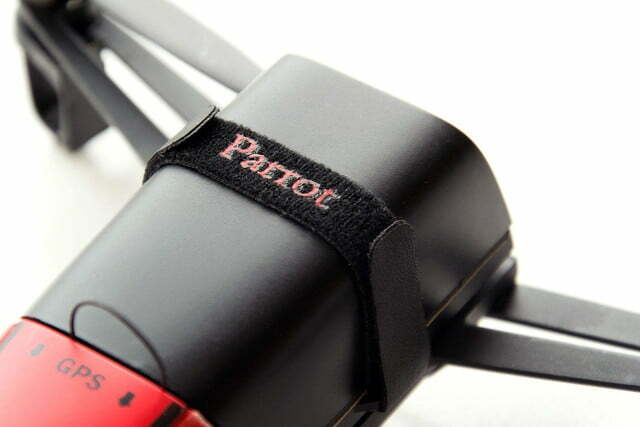 The Parrot Bebop doesn’t feel sturdy. Many of the parts are made from cheap ABS plastic, and much of the camera housing is made from Styrofoam. The battery pack gets strapped onto the drone with a slim Velcro strap. The whole thing looks and feels undeniably flimsy — but I’ll be damned if it isn’t a durable little quad. Parrot has made some really smart design choices here. 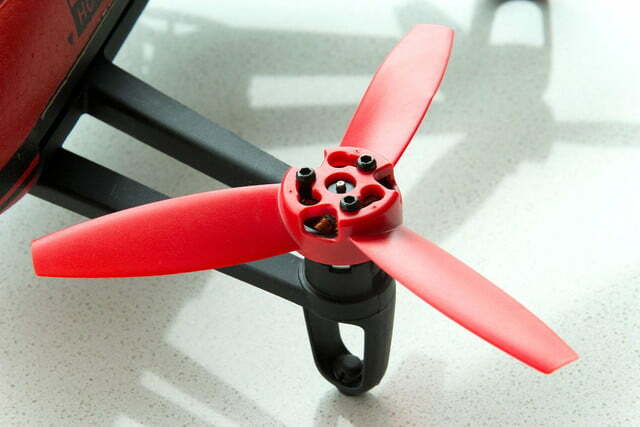 Rather than designing the drone from hard, rigid parts, it opted for lightweight and flexible — which is brilliant. If other drones are oak trees, the Bebop is a reed. It bends and flexes a little bit, so in the event of a rough landing, its far less likely to crack or break apart. On the first few flights, I decided to fly it indoors, and use the prop guards to keep from destroying my lamps, or getting the drone all tangled up in the drawstring of the blinds. Turns out that was a bad idea. The quick start guide failed to mention that you need to change the drone’s settings when the prop guards are on — otherwise it drifts around the room and is very slippery to control. The first thing we did when we took the Bebop out of the box was charge the battery. It was completely dead, and took exactly one hour to charge. This time remained constant throughout our testing, give or take a minute or two. When you take your fingers off the controls, it stays put. Period. For that charge time, you’ll get about 10 or 11 minutes of flight time. In our first test we made it hover in place until it could no longer stay up, and it lasted about 11 minutes, so Parrot isn’t lying about battery life. While flying at higher speeds, however, it dips to 9 or 10 minutes. 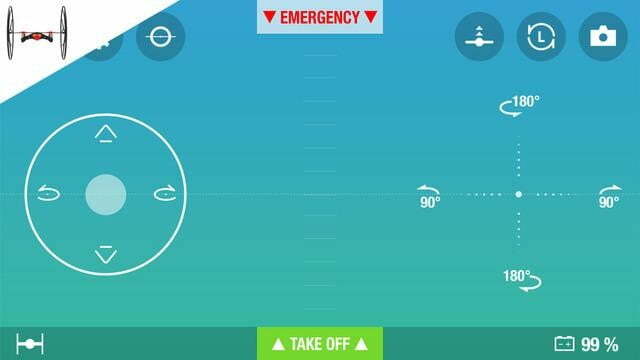 Luckily, the accompanying Free Flight 3 app displays the battery life in real time, and the drone will fly back and automatically land when it gets critically low. Those times aren’t great compared with the 20 minutes of a drone like DJI’s Phantom 2, but the good news here is that Bebop comes with an extra battery pack, and extras only cost about $30. That’s pretty cheap compared to other drone batteries, so you don’t have to break the bank to get extra fly time. If you’re looking for a drone that’s easy to fly, look no further. The Bebop definitely isn’t as dynamic or precise as, say, the DJI Phantom 2, but the controls are pretty straightforward and easy to pick up. 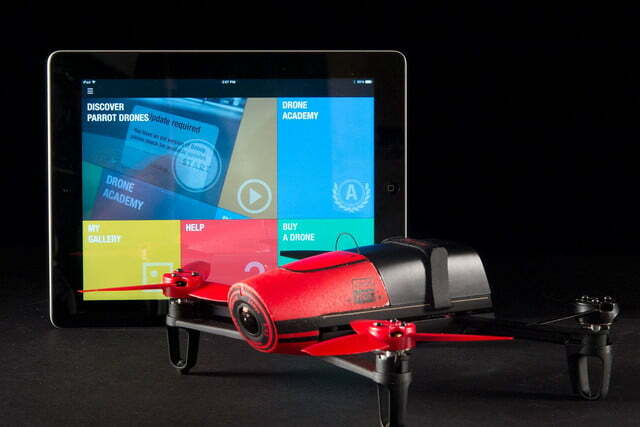 You definitely don’t need previous flying experience to pilot this drone. 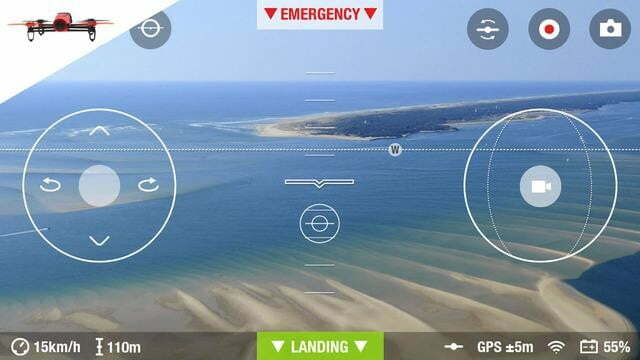 Takeoff and landing can be performed with a single button press, and steering the drone around is as easy as tilting your phone or tablet in the desired direction. Pitch and roll are mapped directly to your device’s internal accelerometers, making forward, backward, or side to side movement extremely intuitive. Unfortunately, yaw and acceleration (propeller speed) aren’t quite as easy to control. You control these with a virtual joystick on your touchscreen, so ascent, descent and rotation controls feel very mushy and imprecise. It’s a lot like playing a FPS game on a smartphone — it’s doable, but oftentimes a little bit frustrating, and definitely not as gratifying as playing with a dedicated controller. One feature we did like, however, was that the accompanying app allows you to tweak the responsiveness settings for all four degrees of freedom. If you find the Bebop to be too touchy for your liking, you can set limits on how fast it accelerates, how high it can fly, or how much it can tilt in any direction. This feature came in handy on more than one occasion during our testing — especially while flying indoors. Don’t let the Styrofoam hull and Velcro-strapped battery pack fool you — this drone can fly with the best of ‘em. Flight performance was pretty impressive. Parrot pegs the Bebop at a top speed of about 13 meters per second, and a maximum ascent speed of about 6 meters per second. We put those metrics to the test in our own trials, and found both to be accurate. In our rigorous testing gauntlet, we clocked the Bebop’s ascent speed at about 5.7 meters per second, and it managed to clear a football field in an average of 6.9 seconds over three trials — which puts its maximum speed at around 13.2 meters per second. 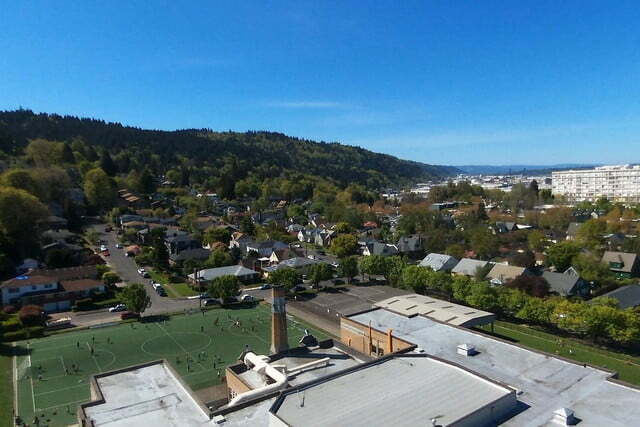 For those of you keeping score at home, that’s just a few meters per second shy of DJI’s Phantom 2. Piloting leaves a bit to be desired, but what Bebop lacks in precision it makes up for with awesome autonomous features. On the practical side, Parrot equipped the drone with a slew of different sensors that work together to keep it incredibly stable. While it’s in the air, the drone analyzes data from its 3-axis accelerometer, gyroscope, magnetometer, ultrasound sensor, pressure sensor, camera, and GNSS system; and uses all this information to adjust itself accordingly. 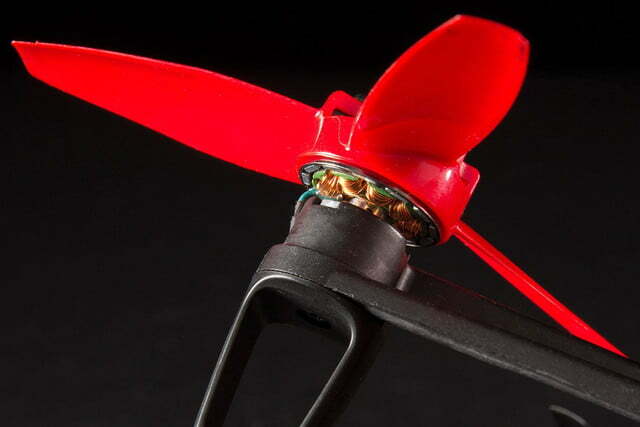 In our tests we found that, even in strong winds, Bebop can keep itself from drifting more than a few inches. When you take your fingers off the controls, it stays put. Period. It also supports waypoint flying. 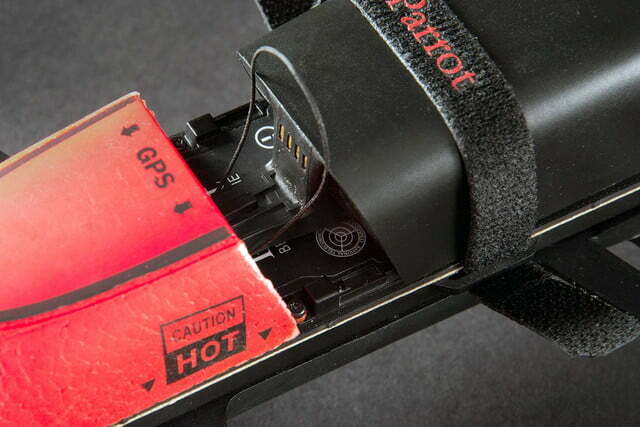 Just load a map onto Parrot’s FreeFlight3 app, set your destination points, and hit go. So long as you’ve got a strong satellite connection, the Bebop will fly to wherever you tell it to. 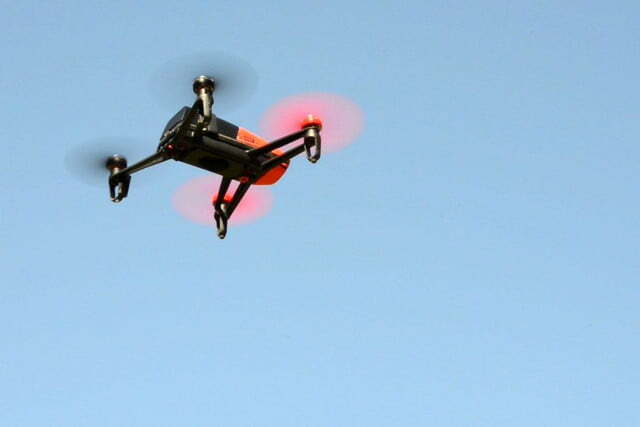 Parrot built it with both GPS and GLONASS connectivity, so it can communicate with more satellites than GPS-only drones, ostensibly improving the drone’s positioning abilities. That’s not all. The Bebop can also perform a number of acrobatic tricks. Tap the screen twice, and it will execute a flip in the direction of your choosing — be it front, back, left, or right– and then return to a hover. It’s a pretty cool little stunt, and is admittedly quite fun to do in front of onlookers at the park. Unlike some other drones, where the camera seems to be an afterthought haphazardly slapped to the craft’s underbelly, the Bebop’s 14-megapixel, 1080p camera is the center of the show. It’s mounted right smack in the middle of the drone, and everything else seems to be built around it. This unique configuration comes with its own set of pros and cons. 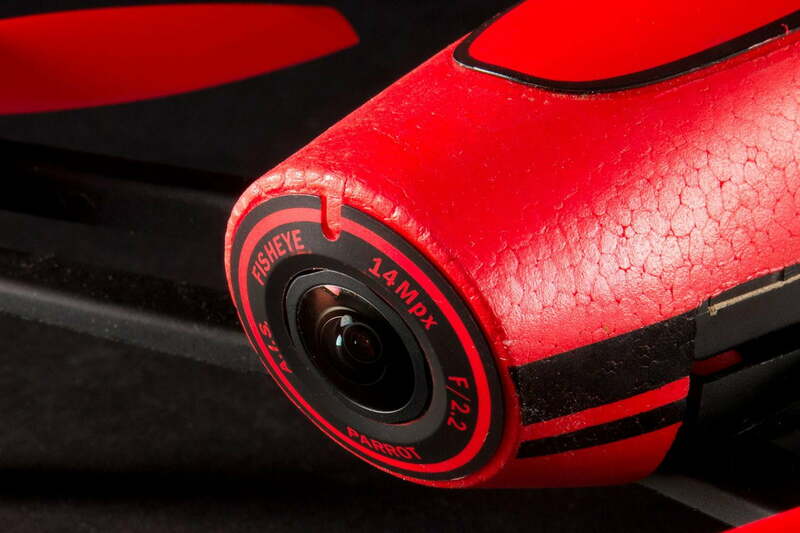 On the upside, this top-mounted system helps protect the camera from hard landings. Sort of. It’s definitely still possible to crash land Bebop on its head – but still, there is a certain comfort in knowing you probably won’t wreck your camera if you make a rough landing. The downside, however, is that the camera’s range of motion is fairly limited. 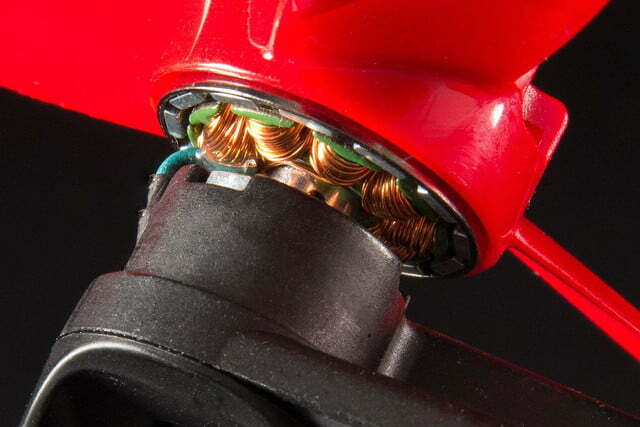 The Bebop’s camera is positioned straight forward, and it can only look where the drone looks. As such, it can’t look downward very easily. Parrot attempts to remedy this shortcoming with a super wide angle (180-degree) lens and digital panning abilities, but there’s no skipping around the fact that Bebop can’t look straight down. It’s not a huge drawback by any means, but definitely something to keep in mind if you intend to do any kind of aerial videography. 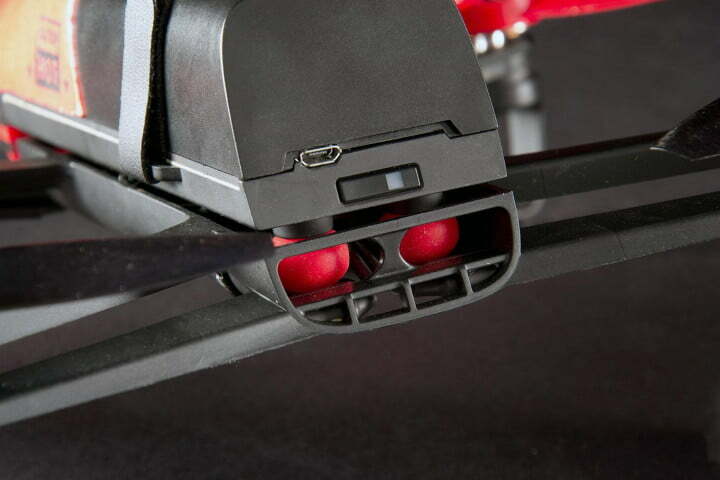 Accessories for this drone aren’t horribly abundant, but they do exist. If you want to upgrade, you can snag yourself Parrot’s SkyController for $400, which gives you physical joystick controls, and doubles the Bebop’s range. It’s a bit on the spendy side, but would be a smart investment for pilots who feel limited by Parrot’s tablet-based control system. 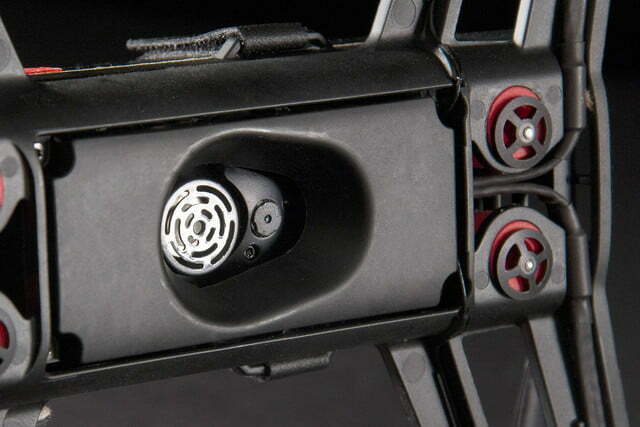 In terms of reparability, the Bebop’s ridiculously simple design means that it’s a breeze to fix if anything breaks. All the major parts (motors, rotors, arms, feet, camera, etc.) are readily available online, and fairly cheap. 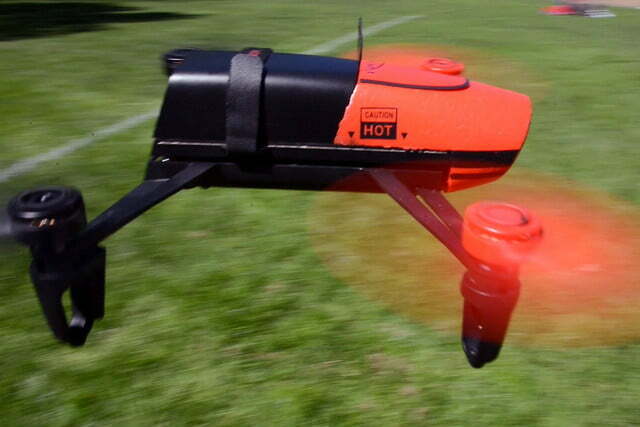 You could give this drone a serious beating, and likely repair it for less than 50 bucks. 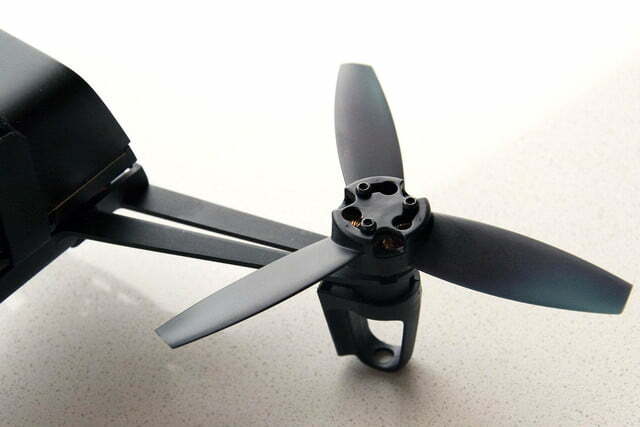 That’s a serious boon for pilots on a budget, and gives you more confidence on risky flights. We had our doubts about the Bebop at first, but after flying it around for a couple weeks, we’ve learned not to judge a book by its cover. Don’t let the Styrofoam hull and Velcro-strapped battery pack fool you — this drone can fly with the best of ‘em. 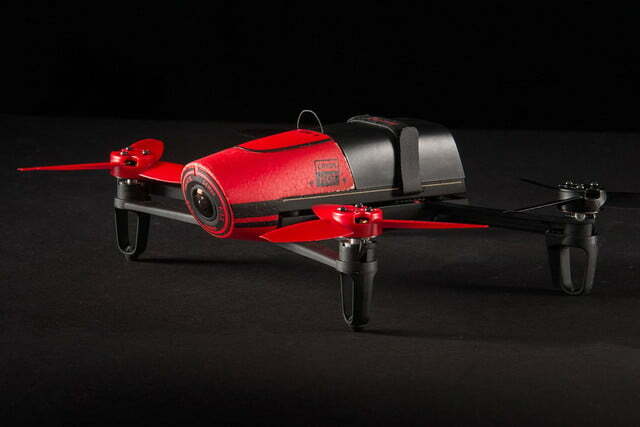 The Bebop lacks the precision and range that more expensive drones have, but those are really its only shortcomings. 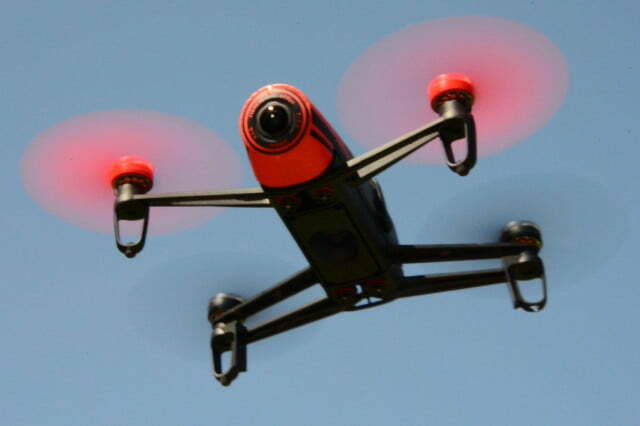 What it lacks in precision it makes up for with simplicity, durability, and a really enjoyable flying experience. Mastering the controls only takes a few minutes, and even if you do mess up (you will), the Bebop can take a tumble like it’s nothing. And best of all? You can stuff it in a backpack, so it’s not a pain to carry along on a day hike or a stroll along the beach. If you’re looking for a simple and affordable way to dip your toes into aerial videography, the Bebop is a great place to start.